"Finally we have a visually pleasing and user friendly ear chart." 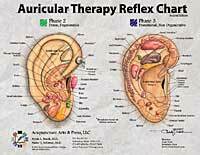 These charts were designed by IMS in coordination with a medical illustrator and graphic artist to give a visually pleasing reference to the advanced auricular therapy phases. Designed on an anatomic model, each of the 4 phases is illustrated in easy to recognize musculoskeletal and organ presentations with specific locations for acute, chronic, and degenerative conditions, as well as the mastoid or posterior surface of the ear (Phase 4). Treating according to the advanced locations will allow the practitioner to treat chronic and degenerative conditions more specifically and lead to greater clinical efficacy. Frequently the failure of simple Phase 1 auricular therapy in chronic and degenerative conditions will be resolved by also examining for active points in the Phase 2 and 3 zones, and treatment of those appropriately. 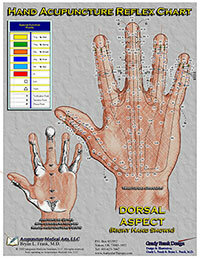 Each chart is 24"x 36", constructed of standard glossy poster stock, and shipped in a poster tube for safety. 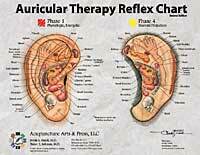 The chart is suitable for framing or laminating for the office setting and gives patients an easy reference to auricular therapy for patient education and counseling. A two-sided 8.5" x 11" Quick Reference Card for keeping on the counter in your treatment room. Contains the same information as the large Wall Chart, with Phases 1 and 4 on the front and Phases 2 and 3 on the reverse. Card is constructed of heavy glossy card stock for ease of use. 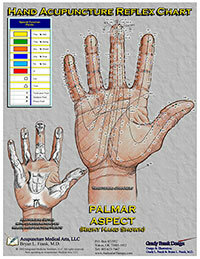 Beautiful anatomic renderings with 2-sided, full color illustrations. These 11" x 17" sized charts use conventional acupuncture channel numbering rather than confusing numbering systems often seen for only $27.50. Command Points and Influential Points references are given. NEW - now offered in economical 8.5" x 11" size for only $17.50! 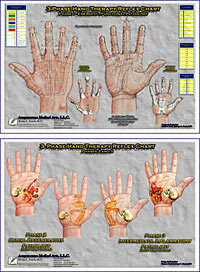 As first presented in Medical Acupuncture, September 2005 by Dr. Nader Soliman and Dr. Bryan L Frank, the advanced phases of the hand representing dense, degenerative pathology (Phase 2) and intermediate, inflammatory pathology (Phase 3) on one side and all the previous chart information on the reverse side. Laminated 11"x17" charts with the same highly acclaimed artistic renderings demonstrating anatomy and channels clearly and professionally. Only $27.50.